Pakistan’s prime minister has been lobbying for progress on projects that show little sign of progress. For better or worse, Pakistan is often overlooked as a potential partner within Central Asia. The reasons are easy enough to identify: Between relations with Russia, China, Iran, India, and the West, there’s only so much scope to allocate additional resources to building relations with relatively distant Islamabad. Still, the dearth of interactions between Pakistan and Central Asian governments remains surprisingly obvious. This distance is all the more striking when considering the linchpin role Pakistan plays in America’s two primary regional resource projects: the CASA-1000 electricity grid and the Turkmenistan-Afghanistan-Pakistan-India (TAPI) gas pipeline. Pakistan remains a pivotal, necessary player within both projects. But Islamabad is often a distant afterthought within Central Asian capitals, overshadowed by more important, and attentive, neighbors. Pakistani Prime Minister Nawaz Sharif spent most of the past month attempting to rectify relations, or at least providing a clearer path forward. Swinging through Turkmenistan and Kyrgyzstan, Sharif lobbied regional governments to speed up the pair of projects that will theoretically aid Pakistan’s debilitating energy shortage. 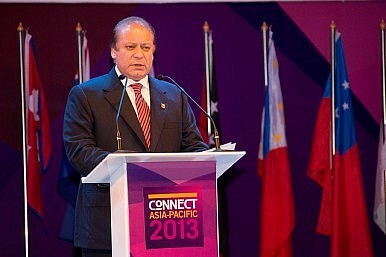 As Eurasianet’s Chris Rickleton noted, however, Sharif’s trip, “publicly at least, did not produce much of substance.” If anything, it highlighted the impotency inherent within Washington’s plans for regional integration – leaving Pakistan scrambling for projects that seem no closer to fruition than when they were first concocted. To be fair, there’s been some public momentum for TAPI over the past few months, especially stemming from Ashgabat. Turkmenistan’s government shows at least some signs of recognizing its client-state status with Beijing, with the predominance of its gas exports heading toward China. But that realization hasn’t yet translated into the kind of on-the-ground progress that might make TAPI a reality. Afghan President Ashraf Ghani recently tossed more cold water on the project, saying the project won’t come online until 2020 – if that. And Khan may be right, if only he’d swap “visionary” for “fruitless.” Even if we leave aside security considerations – and given that Uzbekistani President Islam Karimov has already threatened war over water scarcity in Central Asia, that’s a large caveat – CASA-1000 presupposes excess electricity from Bishkek and Dushanbe. In reality, Kyrgyzstan was recently forced to import electricity from Kazakhstan. In Tajikistan, meanwhile, most regions receive only 12 hours of electricity per day – and the country’s electricity exports to Afghanistan dipped in 2015 by one-third its 2014 rate. Tajikistan’s overall electricity generation is also down 16 percent compared to last year. Somehow, this basic fact – that Kyrgyzstan and Tajikistan have scant supply sufficient for domestic populations, let alone to export en masse – has slipped the affiliated governments, both regional and American. Nonetheless, Sharif pledged “active participation” in CASA-1000. But like diplomats elsewhere, he may simply be wasting his breath. And while it’s nice to see Pakistan attempting to jump its presence in Central Asia, Sharif’s time, energy, and efforts may be better spent on projects that actually make some semblance of sense. Nothing but hopeful language about the pipeline as the Turkmen president visits Pakistan. Tajikistan's Rogun Dam Begins OperationsCASA-1000 Creeps Toward Construction Bridging Central and South AsiaTajikistan: Pakistan’s Gateway to Central AsiaTAPI and CASA-1000 Remain in Project PurgatoryWhat Can Be Done About Central Asia's Water and Electricity Woes?